My wife and I went last night. I had the heirloom tomato salad and the roast chicken. Very tasty! Not quite at the level of the best roast chicken in Manhattan (my favorite is Locanda Verde’s), still very good. Service was still working out the kinks, but there’s a ton of potential. It should be a very solid addition to the neighborhood. It is a bit weird to sit in amongst all the construction. My only major criticism, at this point, is the drink list. For a place that has 2 bars and bills itself as a “bar and grill”, the drink list is completely uninteresting and unimaginative. They need to get a good cocktail director like Don Lee or Phil Ward to come in and give their list some excitement. They do have a decent selection of beer on tap, though, so that’s a big plus. I’ll be trying breakfast there soon. Good breakfast options near the southern end of BPC have always been a bit slim, so if they can come correct I will be visiting often. FYI – They are currently running a 10% off your food special from now until Labor Day! We had dinner at the new BLT last evening (7.31.10) and it was terrific! My steak was very flavorful with a charred surface, just as I like it, and my wife’s cod was superb. Our service was very attentive, but not intrusive. 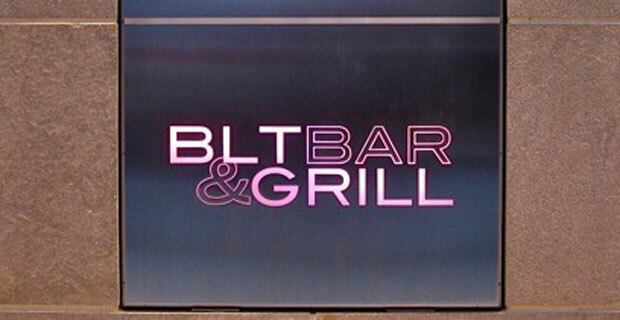 We dine out frequently and will return to BLT Bar and Grill.